The Secondary markers serve as additional sources of audio, and when they are used for this purpose they will not interfere with the recording session. 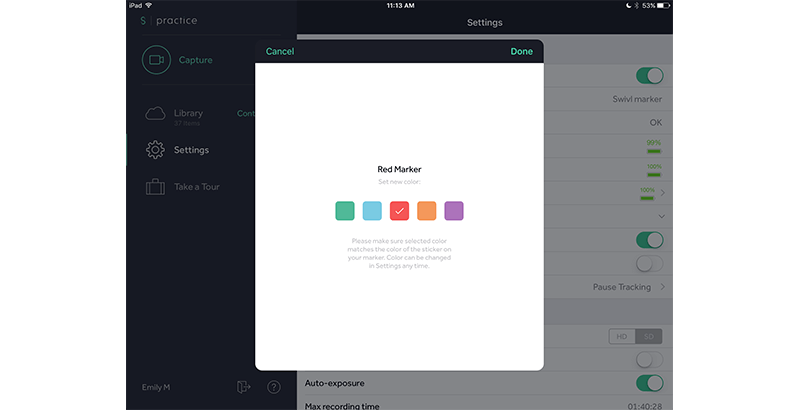 Center Button: The Center Button can be set to perform a couple of actions within the Swivl app in the Settings menu. By default, the center button is used to pause or un-pause tracking. Pause Tracking: Pressing the Center Button will pause tracking, meaning the Swivl robot will no longer follow you until you enable tracking again. This is a useful feature if you need the Swivl to remain still while adjusting settings on your Swivl app on your device. Note that pausing tracking will not pause a recording session if one has already started. The recording will continue, but the robot will remain still. You will need to press the center button again to resume tracking. 360° Video: Pressing the Center Button will cause the Swivl base to do a complete turn to pan around the room. Directional Pad: The Right and Left buttons can do a couple of things. During Live Listening if you are using multiple secondary markers, you can listen to specific student groups live. Otherwise, if you have uploaded slides to your Swivl app, you can control the slides that you are presenting by using the Right and Left arrows. Right will advance to the next slide, Left will go back to the previous slide. More features coming soon! Record Button: Tapping the red button on the side of the marker will initiate recording within the Swivl app. Tapping it again will stop the recording. Note that you cannot pause a recording and then resume it. If you end the recording you will have to start another one by tapping the record button. Swivl is recording when the red light on the Primary marker remains lit. The Marker Packs come with sets of 5 pairs of dot stickers, 2 of each color: Red, Blue, Orange, Purple, and Green. When you pair the additional markers to your Swivl Robot, the Swivl app will prompt you to assign a color to each Secondary Marker. When you choose a color in the app, apply the stickers of the same color to each side of the marker to track which color you chose.